Great for indoor use just about anywhere, popular for use in entrances, lobbies and waiting areas. The understated upscale look of stainless steel makes for an attractive visual appeal, the hands-free pitch-in design of the 15 gallon open top receptacle inspires a positive atmosphere. The rounded open top design perfectly connects to the round stainless steel base, which easily lifts off to gain access to the included galvanized liner. 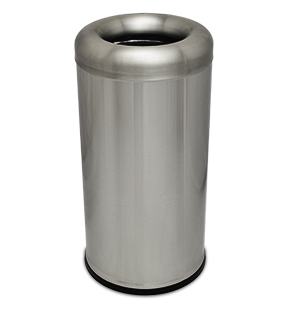 Sanitary stainless steel trash receptacle provides a hygienic surface that is easy to clean and no pores to hold dirt or bacteria. This 15 gallon stainless steel receptacle features a slightly wider base with a durable, hard plastic base ring, protecting the receptacle and floors from potential damages.